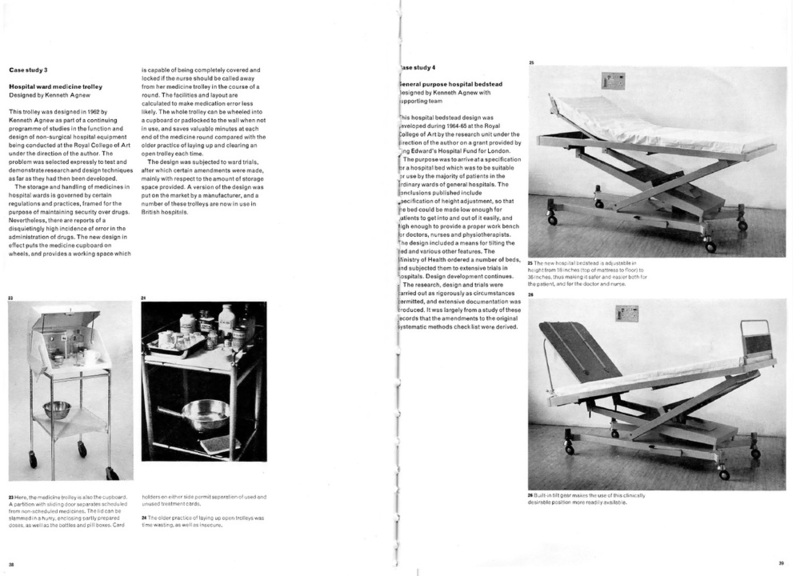 Archer's series of articles for Design magazine in the 1960s, Systematic Method for Designers, was reprinted by the Design Council as an offprint due to demand, and translated into other languages. Systematic Method formed the basis of Archer's 1968 doctoral thesis The Structure of Design Processes. Pages from Systematic Method are reproduced here with the permission of the Design Archive at the University of Brighton. Bruce Archer published a series of Articles in Design magazine in the 1960s, reflecting his thinking on the multiple factors in design and the need to approach them in a methodical way. This was under the third editorship of Design, that of John E Blake. As we discuss here, Archer and his contemporaries were heavily influenced by the scientific practices embedded in Operational Research, Organisation and Methods, and computing. Systematic methods of problem solving are becoming increasingly necessary as an aid to the designer. In this article, the first of a new series, the author sets out the theoretical background to one particular approach which he has developed - subsequent articles will describe the method and illustrate examples (Archer 1963a). This article continues the analysis of the act of designing begun in the first of the series (DESIGN 172/46-49), and here concentrates on that creative element in the process which typifies a human rather than a mechanical act (Archer 1963b). The article describes the first stage of the design method, and provides a check list and an example of the method in use (Archer 1963c). The author continues his explanation of a logical approach to designing and discusses the theory and practice of reconciling solutions to sub-problems (Archer 1963d). The author describes the moment when the process of designing breaks away from a step-by-step method and can only be continued by an act of the designer's imagination (Archer 1964a). The previous articles in this series have analysed the mental processes by which a designer conceives the basic idea for a solution to his problem. This article describes how this basic idea is realised (Archer 1964b). In the concluding article of the series, the author describes how, once having obtained a solution to his design problem, the designer should communicate the solution to all those concerned (Archer 1964c). The approach of 'reconciling solutions to sub-problems' (article 4) is characteristic of Archer's methods. His approach to a complex problem was almost always to reduce it to component, soluble, sub-problems. He also adopted this approach when lecturing, which some students apparently found very dull! Looking at the systematic method, it is easy to feel the force of Archer's remark that 'the logic by which computers work, and the clarity and fullness of expression which is necessary to prepare a real-world problem for computing, are valuable indicators of the sort of logic which might work even without a computer' (Archer 1963e). ushered me into his office. I was seriously nervous. As a 23 year old Aussie fresh off the boat, I had read of the hospital bed project in the colonies and been impressed. More over I had just spent the last 15 minutes studying what appeared the definitive design process in the form of a chart stretching the length of the corridor. The man I was about to see was obviously the God of Design. (CoCreaThink 2005, emphasis added). The principal difference between the 'Systematic Method' series and Archer's doctoral thesis, The Structure of Design Processes (Archer 1968) is that the articles omit many of the mathematical formulae that appear in the thesis. Archer or the editor Blake must have realised that these would alienate and perplex many readers. Archer celebrating the award of his Doctorate on the roof of the Royal College of Art, probably in 1968. From the Agnew Archive, Royal College of Art, London. The systematic approach to design methods has been discussed by Cross (1993; 2007), Glanville (1999), Dorst (2003), Bayazit (2004), Margolin (2010), Pavitt (2012) and many others. Two early figures to rebel against the systematic methods movement were John Chris Jones and Christopher Alexander. Jones complained, in an article for Design the year after Systematic Method appeared, of 'substantial but not always very practical publications,' 'both vague and dogmatic, [with] little reference to the work of practising designers' (Jones 1966). He may have been referring to Archer. Rationality, originally seen as the means to open up the intuition to aspects of life outside the designer's experience, became, almost overnight, a toolkit of rigid methods that obliged designers and planners to act like machines, deaf to every human cry and incapable of laughter. (Jones 1980:173). I would say forget it, forget the whole thing. Period. (Alexander 1971). Later, Archer came to regret some aspects of the Systematic Method. He felt that he had 'wasted a lot of time trying to bend the methods of operational research and management techniques to design purposes' (Archer 1979). He now offered a dramatically different approach: humanities, science and design were equal points of a triad of disciplines. Archer announced that 'there exists an under-recognised but definable third area of human knowing, additional to numeracy and literacy' (1978: foreword). We discuss the development of Archer's thinking before, during and after the Systematic Method period in our paper for DRS 2016 (Boyd Davis and Gristwood 2016). Archer, L. Bruce. 1963a. Systematic method for designers: Part one: Aesthetics and logic. Design 172. April 1963. 46-49. Archer, L. Bruce. 1963b. Systematic method for designers: Part two: Design and system. Design 174. June 1963. 70-74. Archer, L. Bruce. 1963c. Systematic method for designers: Part three: getting the brief. Design 176. August 1963. 52-57. Archer, L. Bruce. 1963d. Systematic method for designers: Part four: Examining the evidence. Design 179. November 1963. 68-72. Archer, L. Bruce. 1963e. Lecture to Architectural Association School of Architecture. Unpublished typewritten notes. L Bruce Archer Archive, Royal College of Art, London. Archer, L. Bruce. 1964a. Systematic method for designers: Part five : the creative leap. Design 181. January 1964. 50-52. Archer, L. Bruce. 1964b. Systematic method for designers: Part six: The donkey work. Design 185. May 1964. 60-63. Archer, L. Bruce. 1964c. Systematic method for designers: Part seven: The final steps. Design 188. August 1964. 56-59. Archer, L. Bruce. 1968. The structure of design processes. Doctoral thesis, Royal College of Art, London, 1968. British Library Shelfmark: Document Supply DRT 484530. Available on Ethos. Archer, L. Bruce. 1978. Time for a Revolution in Art and Design Education. RCA Papers No. 6. Royal College of Art, London. Archer, L. Bruce. 1979. Whatever became of Design Methodology? Design Studies 1(1). July 1979. 17-20. Bayazit, Nigan. 2004. 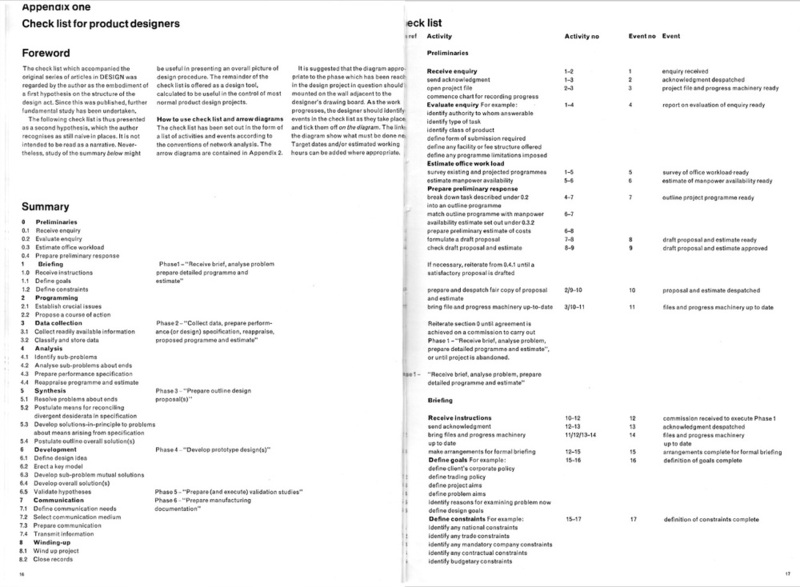 Investigating Design: A Review of Forty Years of Design Research. Design Issues 20(1). 16-29. Boyd Davis, Stephen and Gristwood, Simone. 2016. The Structure of Design Processes: Ideal and Reality in Bruce Archer’s 1968 Doctoral Thesis. Proceedings of DRS 2016, Design Research Society 50th Anniversary Conference. Brighton, UK, 27-30 June 2016. CoCreaThink. 2005. CoCreaThink Design Community. A set of informal reminiscences of Bruce Archer on the occasion of his death. http://thinkdesign.cgu.edu.tw/c2t/pop_printer_friendly.asp?TOPIC_ID=1151. Accessed 6 May 2016. Cross, Nigel. 1993. A History of Design Methodology. In M. J. de Vries et aL (eds. ), Design Methodology and Relationships with Science. Kluwer Academic Publishers. 15-27. Cross, Nigel. 2007. Editorial: Forty Years of Design Research. Design Studies 28(1). 1-4. Dorst, C.H. (Kees). 2003. The problem of design problems. In: E. Edmonds & N.G. Cross (Eds. ), Expertise in Design, Design Thinking Research Symposium 6. Sydney, Australia: Creativity and Cognition Studios Press. Glanville, Ranulph. 1999. Researching Design and Designing Research. Design Issues 15(2). 80-91. Jones, John Christopher. 1966. Design methods compared 1: Strategies. Design 212. 32-35. Margolin, Victor. 2010. Design research: Towards a history. In Proc. Design and Complexity - Design Research Society Conference, July 7-9, 2010 at School of Industrial Design, Université de Montréal, Montreal, Canada.